"Mmmmmmmommy!" says the speech therapist. She and Max are seated at our kitchen table. J has been coming to our home basically every Saturday morning for the past seven or so years. Max's attention span used to be spotty during their sessions, but in the last year he is totally focused—and the sounds he makes are wondrous. "Mmmmmmmommy!" says Max, and I smile. I'm hovering in the living room and listening in. Max doesn't like me to sit with them. In general, Max doesn't like to let on that he is able to do more than he shows me and Dave. He is all too comfortable not trying his best around us and I'm pretty sure this is because he is used to letting us doing the work, like guessing what he is saying—and glad for it. If I wander into the kitchen during speech therapy, Max will say "OH!" and point to the door and then the speech therapist will say "GO! ", effectively enabling him to kick me out of the room with the proper articulation. "No, Max, watch my lips," she says. "Fire-man!" And then, I hear a clear "Fire-man!" And that's the way it goes. Max produces sounds and articulates words for the speech therapist that I am often unable to get him to replicate otherwise. This is both inspiring, because I know he can make them, and frustrating...because I know he can make them. The consonants are the hardest for him; too bad there are 21 of them, and five vowels. The therapist often uses Chewy Tubes and Bite Blocks to loosen up his jaw before she starts getting him to talk. She's also used Nuk Massagers and Jigglers over the years to reduce oral-motor sensitivity. I don't use those to help him as much as I could or should, so in some ways it's no surprise I have trouble recreating the sounds she gets. But also, Max just doesn't give me his speech all. It's been this way in physical and occupational therapy sessions, too, over the years. But it's most noticeable in speech therapy, the area that is probably his biggest challenge right now. Lately, J has started giving us a word of the week to practice. Last week it was "Mommy" (perhaps the most fabulous word in the entire English language) and Max got really sick of me telling him, "Mommy! Max, say 'Mmmmmmmommmmy!'" He finally staged a momcott and just kind of grunted at me. Yet there's much awesome. Because Max makes sounds, all sorts of sounds. Especially when he's in the bathtub, and babbling away. Or making videos of himself talking, as he loves to do lately. And he has words. And we're eons away from those days when I'd drive around with Max and I kept praying I'd hear babbling or any speck of sound from the back seat but, nothing, and I'd feel so anxious. And so, "Ohmmy!" I am, for now. And "Ahh-eee!" Dave is. And I'll take it. Oh, boy, I'll take it. 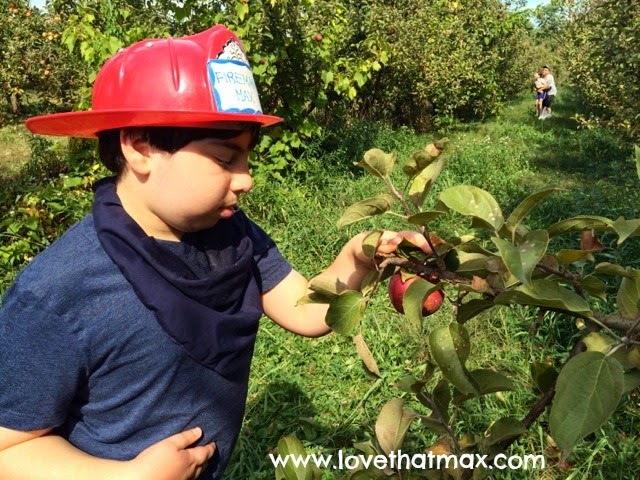 We went apple picking on a sunny fall day...just like any family. I think this is something that people often don't get about families of kids with special needs: We have our challenges but in many ways, we are just like other families. We had to stop more times than we imagined we'd need to en route to the farm...just like any family. The kids fought in the back seat...just like any family. I had to remove their electronic devices from their hands so they would look up at the fall foliage...just like any family. 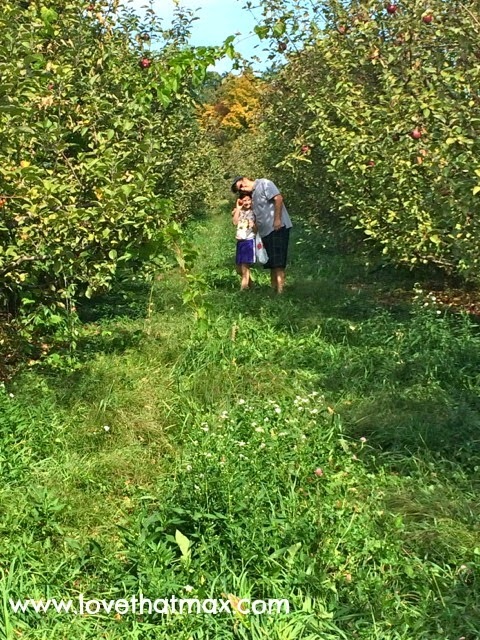 The kids wanted to take more bags and pick more apples than we could humanly consume in a year...just like any family. We were divided about green vs. red apples...just like any family. At first the kids went for the low-hanging apples...just like any family. The kids only wanted to take the apples with perfect coloring even though I told them they were all yummy...just like any family. The kids were a wee bit competitive about who could get more apples...just like any family. 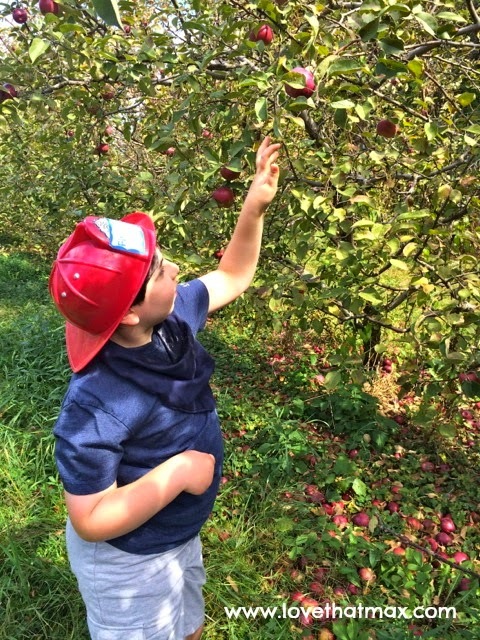 One of the kids had to pretend there was a raging fire in the orchard and he needed to put it out...OK, not just like any family. Then the kids decided to only go for out-of-reach fruit and suddenly they were begging us to practically climb trees...just like any family. Then the kids had a fight because somebody stepped on somebody's foot and somebody clonked someone on the head with an apple when it fell off a branch...just like any family. Then the kids got bored and we had to convince them to stay a while longer...just like any family. Then we sang silly songs as we picked apples...just like any family. Then the kids got hungry for lunch even though it was 11 a.m....just like any family. Then we remembered that we hadn't packed any snacks and come to think of it maybe we should have worn sunscreen...just like any family. 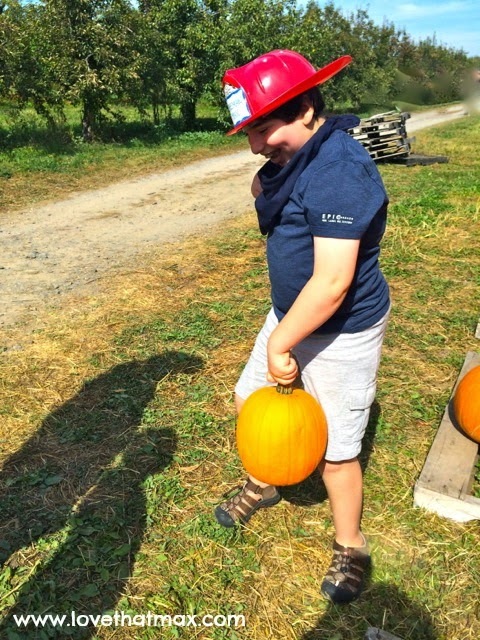 Then the kids wanted to buy pumpkins that practically outweighed their bodies...just like any family. Then we let the kids have ice-cream before dinner because we found the most awesome homemade ice-cream place...kinda sorta like any family. Then we stayed too late in the area and hit traffic and got home way too late...just like any family. Then we Googled apple pie recipes...just like any family. Then we went to sleep content, with visions of apple pies and homemade applesauce dancing in our heads...just like any family. 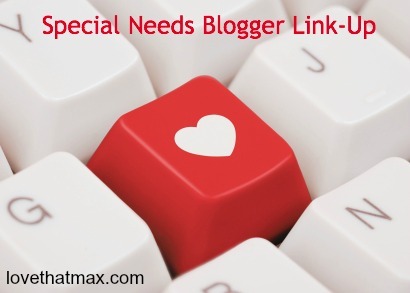 The Special Needs Blogger Weekend Link-up: post-a-palooza! Hello again! It's good to have you back. This guest post is from D, a woman I connected with on Facebook. She's 24 and in graduate school, working toward a master's in early childhood and special education. She has mild spastic and ataxic cerebral palsy, along with learning disabilities and ADHD. A self-described "bookworm," she's previously worked as an instructional assistant for elementary age students with special education needs. This is what she wanted to share. Please explain what an invisible disability is. Though I have cerebral palsy, which many do not coin as an invisible disability, how it impacts me is all hidden. Unless someone is staring at my hands they will not see my intention tremor. My gait is slightly off, but I do not utilize any form of a mobility aide, so most people do not notice it. From my experience, an invisible disability is exactly that: the effects of said disability are not seen by the eye. Within the hidden disability community, you might have a combination of visible and invisible disabilities. Invisible disabilities include mental health disorders, some forms of autism spectrum, learning disabilities and ADHD, some forms of vision impairments and some types of chronic illness and even some forms of a physical disability (as seen in my experience with cerebral palsy). When did you first become aware of what it meant to have an invisible disability? I was not aware that I had any disabilities until I was around nine years old. I remember going to my family and asking them why I couldn’t ride a bike. My disabilities cause sensory integration dysfunction, and my visual motor, proprioception and vestibular inputs are affected. My family explained, “This is just how you are." In became acutely aware of my social deficits and processing deficits in middle school. I was often frustrated with trying to keep organized and understand the concepts being taught. Often, if the pace in a class is too fast I will become anxious as my brain attempts to process all the information. At times, this can lead to meltdowns. Having an invisible disability makes it difficult to explain to others why you are taking so long to do things, how you can have such strong vocabulary but struggle with writing fluency (often my words are there but I struggle to get them on paper in an organized way), why you might not be the most coordinated and why you have to ask so many questions in class (I have to rely on my extremely high verbal skills to compensate for my very weak nonverbal skills). In high school, I took some remedial classes deemed “special math.” Everyone knew if you took classes in the basement with the community school it meant you were “special.” I felt like I had a “disability stamp” on my forehead a lot of the time but couldn’t quite fit in with those who had visible disabilities since they often said, "You are not like us." Having an invisible disability for me has meant you don’t quite know where you fit, but you try your best to find your place. What do you wish people knew about invisible disabilities? People think that learning disabilities “go away” when you finish high school or college. I still have them. I will always have them. Also, since I am able to compensate for my learning disability, this leads to people again questioning the validity of the diagnoses. “How can you be so smart and have all these disabilities?” they ask. (I currently have a 4.0 GPA). I have had breakdowns, I am far from perfect. The reason I try so hard is because I know what I am capable of. A big challenge for me personally now with finding employment is my inability to drive. I tried driving lessons with adaptive driving but unfortunately they were unable to accommodate for my neurological impairments—executive function, processing and visual perception. The paratransit in my home state is not reliable and often does not go to the locations that I am being moved to for work. I hear all the time from people “Just get your license!” Trust me, I would if I could. I hear all the time from people “You are really smart for having a learning disability,” as if that is some sort of clause that means I shouldn’t be intelligent. I hear from others with cerebral palsy “You don’t advocate correctly” as if there is only one way to advocate. I hear professors that have told me I would never earn an A because “People like you just don’t earn those types of grades,” as if there is some reason I can’t possibly earn the same grades as others. I hear people tell me “Just try harder” when I am repeatedly telling them I need help with this, or I admit to an inability to do a task. They act like I compensate for so much I should be able to do everything. I hear people all the time telling me “You don’t act disabled” as if there is some sort of way we should act. I hear the voice of someone I used to know with visible disabilities tell me I have "passing privilege," as if having to prove your identity is something of a privilege. Sure, people with invisible disabilities don’t experience nearly as many physical accessibility concerns. The social justice accessibility, the value of our worth, the question of our validity in a diagnosis that may not fit in a diagnostic box: That is what truly makes our disabilities invisible. I wish people would understand the complexities of disability. I wish people would understand how each individual has a unique profile with and without their disabilities. I wish people would understand when I ask for support I am not doing this to cop out. I am asking for support as a human being because I have rights. Disability rights are human rights.I am not asking for pity. I am not asking to be like everyone else either. I am asking for an opportunity to be myself, just as I am. What's your best advice for parents of children with invisible disabilities? In short: Listen to them, they know their brain best. Know that even if they are compensating with strategies, it doesn't mean they might not need help. Listen to them when they want to open up about school and life issues. Include them as much as possible in their IEP/504 meetings; give them an opportunity to try, with no judgments. All kids may (and let's face it, will) fail at something, but if we constantly protect "special kids" they develop learned helplessness. Change the concept of "I can't teach/take care of my own child" guilt into "I care so much about my child that I am willing to do anything it takes to help them." Let them tell you what they need. A lot of times parents try to help and it only intensifies an issue that really wasn't one. It's most important to listen and let your kids be as independent as possible—yet supportive when they need you. The day was crisp and sunny, with all the promise those early days of fall hold. At lunchtime, I headed out of the office to take a walk and...discuss pants. Specifically, pants that would work for Max. I got on the phone with the head of the occupational therapy department at Max's school. I'd reached out because I was concerned that we hadn't yet found a firm solution for helping him pull his pants up and down. Max has made amazing potty progress, most recently staying dry overnight. But the fine-motor challenges make manipulating his pants tricky for him. Not being able to handle them on his own is impeding his toileting independence. I've had ongoing conversation about the pants situation with the OT at school and the one who sees him at home. It's sometimes fallen off the top of my to-do list because....to-dos. Recently, at the suggestion of the school OT, I bought Max a bunch of sweatpants one size too large so sliding them down and up would be easier. He's mostly using his left hand (his dominant one) and managing to yank his pants down and then kinda-sorta up, but it's a struggle. His private OT recommended sewing on loops on for him to grasp. None of the adaptive clothing I've seen online has been right for him. I strolled down the block, people hustling by as I said things like, "Maybe it would be a good idea if he had a loop to grasp just on the right side of the pants" and "I think the physical therapist should weigh in too." I listened at she noted how long it takes for someone to pick up a fine-motor skill—up to 5000 times of doing an activity. To me, though, this wasn't a matter of Max needing time to ace a skill. He needed the tools. Specifically: a pants solution. "I want to be really clear, I know that it takes a long time to learn skills but what I'm saying is we need to come up with a definite approach," I said. And she said she'd check with the team and get back to me. I hung up and felt the sun on my shoulders. I looked around at people on their iPhones and doubted that any of them were trying to figure out a pants approach. Or that they'd ever known from pants challenges in their lives or, for that matter, fine-motor skill challenges. Mostly, I don't have have time to consider the volume of things I deal with for either one of my kids, and that's good because if I did I'd promptly keel over. Like most moms, I just go go go, do do do, make it happen happen happen. Those of us parenting kids with extra needs take comfort in knowing that a team of people are there to help guide both us and our child. And: COFFEE. We take comfort in coffee. Then suddenly, you're walking down a busy street in the middle of New York City and having A Moment. Doubts swarm your mind: Why has this taken so long? This isn't fair to him. What about shirts? He can't put those on himself, either, and you haven't even given that much thought. Are you on top of things as much as you should be? Are you doing enough to enable him? What else could you be doing? What are you not thinking of? But you can't go there. You will not go there. Because the answer is: You're doing the best that you can. And you take a deep breath and head back in to work. Teasing your kids is fun fun fun! In the mornings, I like to tease Sabrina about the number of outfits she goes through when she gets dressed. "Wait!" I'll say, eyeballing the rejects lying all over the floor of her room. "You haven't yet tried on every single piece of clothing you own!" She'll giggle. 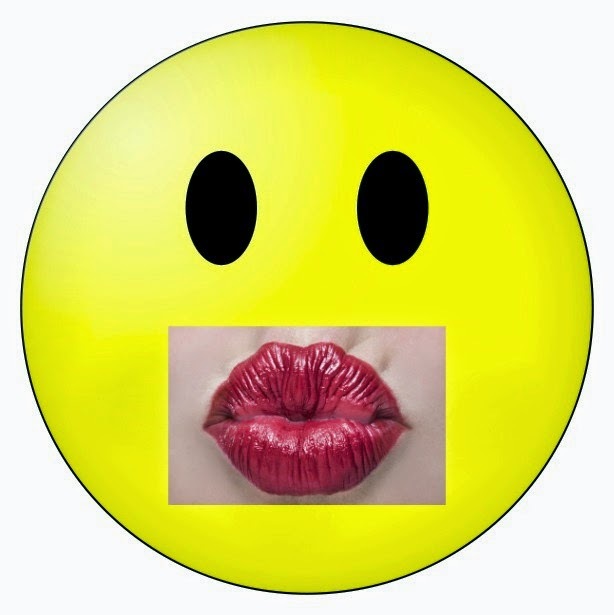 Teasing the kids is ever so much more sanity saving than getting perturbed by their habits and ways. It was only a matter of time before I started teasing Max about his tendency to tell me, approximately every 6.5 minutes, "I want to be a fireman when I grow up." The stanzas include: He's going to ride Ladder 31/He's going to sleep in the firehouse/He's going to eat in the firehouse. The song comes in handy for calming him down when he's upset and generally making him happy. "He wants to be a zookeeper when he grows up!" "He wants to be a baseball player when he grows up!" "He wants to be an ice-cream chef when he grows up!" "He wants to be Mickey Mouse when he grows up!" "He wants to be an astronaut when he grows up!" "He wants to be a clown when he grows up!" "Fireman Max, you don't want to be a hair stylist when you grow up?" "Nooooooo! Ire-anne!" he said, laughing again. "OK, Hairs Stylist Max," I said, mercilessly. Yesterday, Max had the best bike ride of his life. 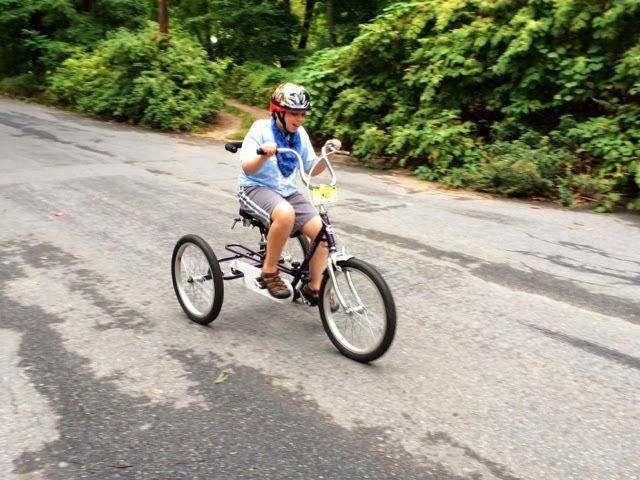 He rode his adaptive trike (a Triaid TMX) down the driveway. Then he cruised up and down our street, steering like a pro, doing turns and K-turns and masterfully navigating bumps on the sidewalk. 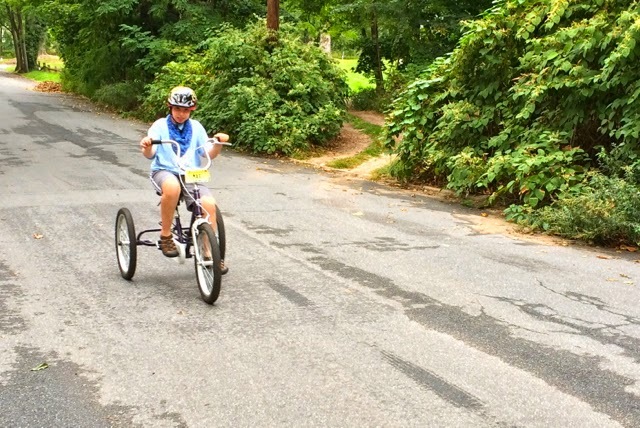 Last weekend, Max had the best bike ride of his life. 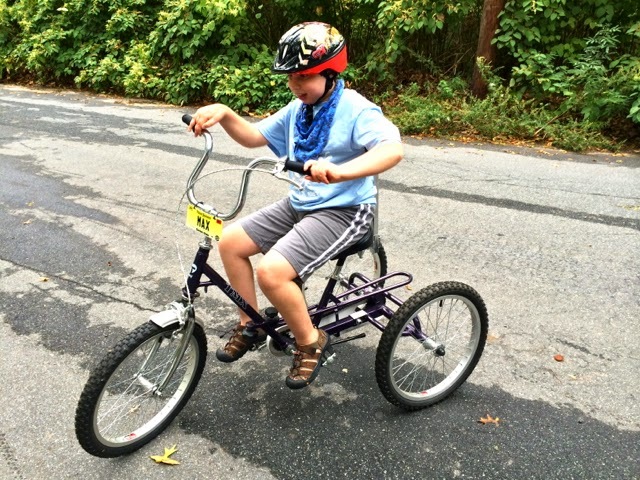 He rode his adaptive trike down the driveway. Then he cruised up and down our street, steering like a pro, doing turns and K-turns and masterfully navigating bumps on the sidewalk. 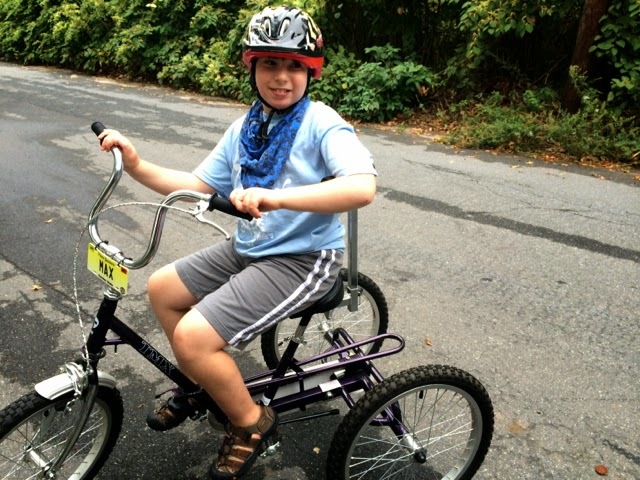 Whenever Max rides his bike, I think it is the best bike ride of his life. Because every single time, I am awed by his riding. Every single time I think, Whoa, that is amazing. It's not that I don't believe he is capable. My heart and mind are scarred from the NICU doctor who warned us about all the stuff for which Max was at risk. He might not walk or talk. He could have cognitive impairment. He could have vision and hearing problems. Not once did that man say anything positive, until I complained to the NICU social worker. And it was only then that he acknowledged that infant's brains are malleable ("plastic," they call it). Doctors are supposed to uphold the "First do no harm" tenet (actually not part of their oath, but still a guiding principle). They should also be careful not to do emotional harm of the kind I and other parents of kids with special needs have suffered. Some of these MDs are the grim reapers of modern-day medicine. If there's one thing parents of kids with medical conditions and disabilities need, it's hope. Not false promises, but some positives to cling to. For years after Max was born, I fantasized about bringing him back to that doctor and triumphantly saying: SEE? YOU WERE WRONG. Max has his challenges, sure, but he sure isn't the tragedy that doctor envisioned. A couple of months ago, I found out that the doctor had passed away. Mostly, I was disappointed that he'd never eat his words. Yet for all the despair that doctor instilled in me, there's this: I never take for granted what Max has accomplished. I will probably always marvel at Max's movements, the ones he wasn't supposed to do. 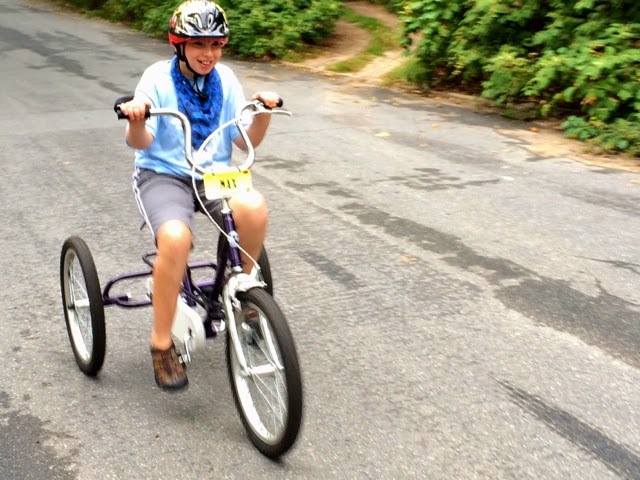 The next bike ride will be the best bike ride of his life, too. Welcome, regulars, welcome, newbies! Nice to have you here. I couldn't wait to get the injection. I've had a frozen shoulder for several months. It's gotten to the point where it is hurting 24/7. I wake up in the middle of the night, in pain, and cannot find a comfortable sleep position. Advil is my new BFF. Anti-inflammatory meds haven't helped. I've tried chiropractic, acupuncture and lots of physical therapy. I got three sessions of Rolfing, a deep-tissue massage technique. The practitioner said that I was "pain/discomfort adverse," leaving me to wonder who isn't (aside from the people who frequent those chat rooms and clubs). Mostly, I was adverse to paying $180 bucks a session for something that didn't work for me. I decided to go back to the orthopedist. A staffer got me onto the schedule asap. Thanks to Max, I have mastered the art of worming my way into appointments, and the secret is to beg shamelessly and throw in a mention that you are not able to adequately care for your children with your frozen shoulder. Which is true. I can no longer help Max down the stairs or get him into the car. When Sabrina wants to sit in a chair and cuddle with me, it hurts to hold her. This whole living-in-pain thing isn't working for me. Being that I am pain/discomfort adverse. My appointment was at 9:00 a.m. I arrived breathlessly at 9:10, apologizing for being late because of a train delay. Actually, it was not a problem. Because the doctor wasn't even going to be there until 9:30 a.m., and there were three people ahead of me. I have patience for plenty of things in life, but an excessively long doctor room wait is not one of them. I spoke with the doctor's assistant. The last time I'd been to this practice, I'd waited an hour. "OK, just tell it to me straight: Does this doctor regularly have issues with being on time?" I asked. He gave me a sheepish look. "Yes, she tends to be a bit...delayed," he said. "Do you want to reschedule?" NO! I wanted my shot. I let my office know I was coming in later than expected. I grabbed iced coffee and a bagel. I tried to focus on reading a magazine. But my arm was really throbbing, making me even more antsy about the wait. When I got taken to a room at 10:35 a.m., the assistant said, "The doctor will be right with you." And I said, sharply, "Right with me?" And she gave me a look and said, "Well, you can ask her!" I immediately felt awful because it wasn't her fault. And I said, "I am in pain, and I really just want to get a cortisone shot." And then I was on the verge of losing it, so I bent over and buried my face in my hands. "Don't be sad or I'm going to get sad!" she said. "Hey, do you like Diet Dr. Pepper?" I looked up. "How did you know?" I asked. "That's my favorite soda!" It was a scene straight out of a hokey TV commercial. "We had an office party the other day and there's a stash of them in the fridge," she said. "Do you want one?" "YES PLEASE!!!!" said I. And when she handed it to me, I put it right against my shoulder and held it there. I needed the caffeine jolt, but I needed the cold even more. It felt good. And suddenly, my mood felt better, too. That little bit of kindness helped—and buffered me for what followed. The doctor finally came in, said "I'm sorry" and started asking about my shoulder. Back in May, it had been in a pre-frozen state but now, she verified as she checked the range of motion (or lack thereof), it was definitely frozen. I asked why my elbow had been hurting, too. "You probably have a bit of tennis elbow because it's compensating for your shoulder," she said. Awesome. We'd talked about treatment possibilities the last time, and I told her that I was all for a cortisone shot. "What's that?" she asked, pointing to the angry red bumps on my wrist. "Oh, it's just a little poison ivy," I said. I'd pulled out a few weeds a couple of weeks ago, and a few days later, those itchy, blister-y bumps had shown up. You'd think after eleven years of living in suburbia I would know better than to do any gardening without gloves, but, no. "Oh, there's poison ivy by the fence!" Sabrina informed me when I told her I had poison ivy. Evidently, she'd spotted it weeks ago, as a good Girl Scout should. Only she'd neglected to inform her Girl Scout Leader mom. "See?" Sabrina said, pulling out a bookmark with a photo of poison ivy that we'd gotten at a Girl Scout event, because those are the types of bookmarks one finds at a Girl Scout event: "It says right here: Leaves of three, let it be!" On the bright side: This child definitely knows how to identify poison ivy. The doctor looked at me. "I can't give you an injection," she said, kindly. "I could inject poison ivy into you." "WHAT?!!!" I said. "But there's just a few patches of it here," I said, pointing to my wrist. "And here," I said, pointing to my chest. "And here," I said, pointing to the crook of my elbows. "And...." Oh. I shut up. Yes, the poison ivy had spread around my body. It was on my skin, bumps big and small and nearly imperceptible, and there was a chance it could infect my shoulder if I got an injection. I swigged my Dr. Pepper for solace and listened as she promised me that after the poison ivy died down, she'd get me an appointment. I walked out of the office oddly calm. My shoulder was hurting like hell. But that Dr. Pepper had been a wonderful panacea, and I was grateful to the medical assistant who'd offered it me. It was yet another reminder that little gestures can be a big deal, especially to someone having a crappy day. And so, if you would like to uproot the poison ivy, remove my left arm or run my Girl Scout meeting tonight, I sure would appreciate that. Max giggles. I have just informed him that, yes, he is going to be able to have his birthday party at the fire station. Well, not technically. First, I'll be renting out a room in the civic house across the street, and after pizza and ice-cream, the kids head over the firehouse for a tour. Max will surely be leading it, of course, given that the firehouse has become his home away from home. 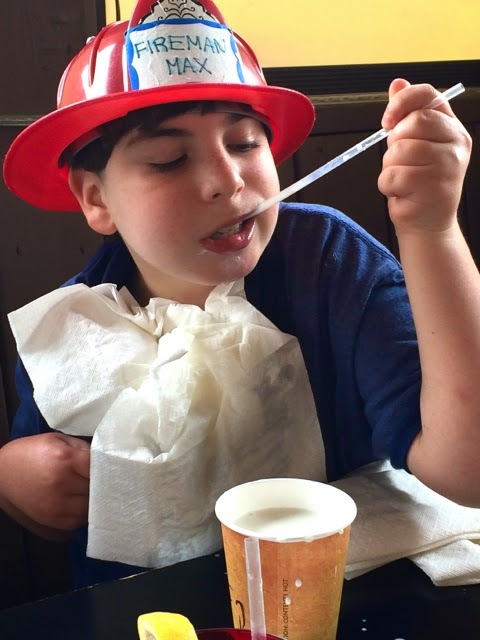 It's not every 11-year-old boy who gets this giddy about birthday parties or visits to firehouses. Or who walks around all weekend long with a fire chief hat that reads "Fireman Max" or who regularly tells everyone he meets, "I want to be a fireman when I grow up." When we visited the station last week, he was so excited to see his favorite guy, Firefighter Connor, that he ran up to him and gave him a gigantic hug. 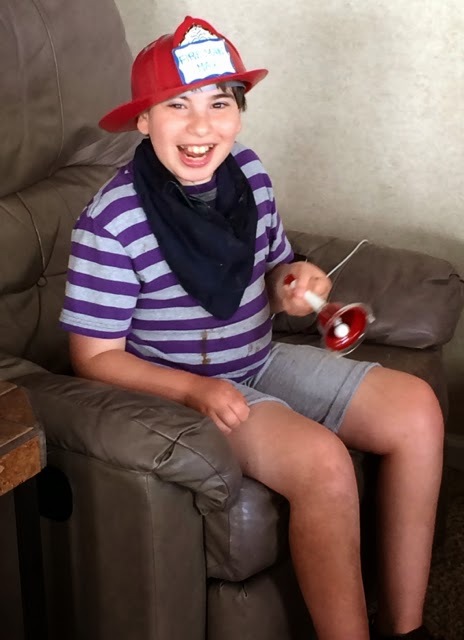 Max may be 11 years old, but he still has plenty of little-kid wonder and glee. It makes me a whole lot happy. That's kind of ironic, because when he was a tot I ached to see what he'd do when he got older, and now that he's growing up, I am loving the little kid left in him. Yes, there are times when I see him around other kids his age and I realize how much younger he is in comparison, and I'll feel a flash of sadness. That's it, though, just a passing moment. Mostly, I'm thinking this: I get to savor his childhood for just a little longer. A little more time to revel with him in joys big and small. Max isn't yet jaded about anything. He has not yet mastered The Eye Roll. This is a kid who literally does a happy dance when I tell him that we are going to the ice-cream store in town. He excitedly points out his favorite kind of car, BMWs, when we are on the road. He has a fantasy trip planned with Dave that includes a ride on a ferry, a stay in a big hotel and a pancake breakfast. He thinks toy fire trucks, Thomas the Tank, bumper cars, pushing the shopping cart at the supermarket, avocado sushi rolls and all things Disney are really cool. And the genuine excitement he expresses is contagious. A little more time to enjoy watching him discover the world. Lately he's exploring it in ways that he didn't when he was younger, venturing into restaurants, museums and even concerts that used to intimidate him because of the din. A little more time to be openly adored, and to adore him right back. When I get Max off the school bus in the afternoon, he beams out at me from the door. When I show up at his school to pick him up for a doctor's appointment or to participate in an event, he is ecstatic. He has no hesitations about expressing love, and he isn't embarrassed if I shower him with kisses. And I will take whatever mush I can get. A little more time to revel in firsts. They're still coming: First time he wrote his address by himself. First time he stayed dry overnight. First time he poured cereal on his own. At this point in his life, there are no more delays. There are only firsts. A little more time to watch him being naughty. Because as irksome as kids are when they're acting out, there is something very delicious about watching them experiment with pushing your buttons. The other night, I was telling Max something he didn't want to hear (he'd been getting a little impatient with a therapist). So he started tipping over a pile of papers I'd left on a chair, one hand on the papers, both eyes on my face to gauge my reaction. He knew exactly what he was doing. I had to stifle the laughter and tell him not to do that but...delicious. A little more time to play out fantasies. Max is convinced he is going to be a firefighter when he grows up. We talk about it every day: Which firehouse bed he will sleep in (the one by the TV), what he will make for dinner for everyone (mac 'n cheese with ketchup). He believes. 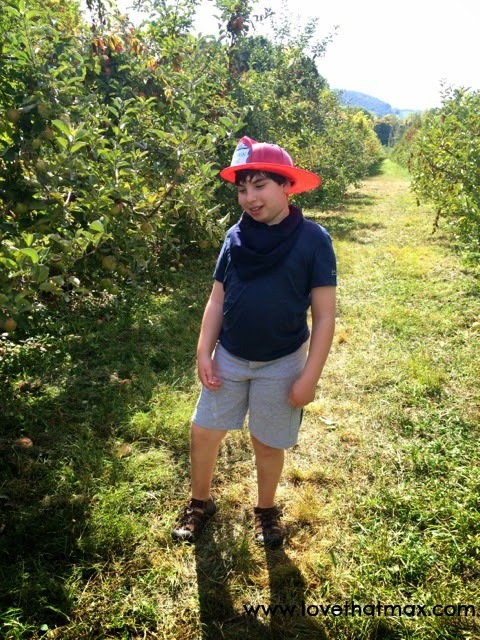 And when I listen to him gush about his future life as a firefighter, when I see him clomping around in his firefighter boots and gear, I think, Who am I not to believe? I say "a little more time" but the truth is, I don't know how much longer Max will be like this. Maybe it will be years. Maybe some of these traits will be for always. How will I feel if, at 18, he's still walking around in a plastic fire chief hat? At 25? I can't say for sure. But no matter what, he will be Max, a child who has brought me joys of all kinds, and always will. First: Get an email from another parent informing you that two kids your child had a playdate with today have been found to have lice and she strongly suggests you check your kid. Or school sends home a letter that a kid in your child's class has lice. Do not panic. Do not panic. Do not.... LIKE I NEEDED ONE MORE THING TO DEAL WITH!!! I DON'T HAVE TIME FOR THIS!!! WHY ARE KIDS STILL EVEN GETTING LICE?!!! CAN'T, LIKE, THE iPHONE PEOPLE FIGURE THIS OUT?!!! Suddenly, your head will start to itch preemptively. Remain calm. Remain OH MAH GAWD WHAT IF I HAVE LICE TOO? WHAT IF EVERYONE IN THE FAMILY GETS IT?!!! Ask your child if she's been using that anti-lice hair detangler spray. No, she hasn't, because it got left in the hotel room on your last vacation. In fact, as you walked out of the room you said to your husband, "Honey, let me take one last look" he said, "Nah, let's just go." So really, this is all his fault. OMG, your head is itching. Now ask your child just how much contact she had with the other kids. She didn't, she says, she just hugged them. OH MAH GAWD. • Check, check, check, and check again with a flashlight and pick out anything suspicious. • There really is not yet anything to DO yet, says a former school nurse; keep a watch on itching and look at the hair behind the ears and on the back of their head for white specks that look like small rice that are attached to the hair shaft and not easily pulled off. That means your child has lice but there is an incubation period involved so keep watch. • Rub a good amount of coconut oil through hair and scalp, leave on for 15 minutes, comb out. It suffocates the little effers. • Don't wash the hair, since lice like clean hair. • Use a tea-tree oil shampoo. • Use Ladibugs pesticide-free head lice treatment. Or check out products at the Lice Treatment Center. Or get the NISSKA Lice and Nit Removal Comb. • Call Lice Happens, a Northeast service run by an RN who makes housecalls. There is a 24-hour Liceline! • Douse hair in mayo, to stifle the effers. • Use Cetaphil, which works like mayo. • Coat her hair in olive oil and add penne and garlic. Oh, wait, just add the olive oil and wrap with plastic overnight and comb. • Treat with a natural lice shampoo, just in case. • Douse her head in conditioner and start combing with a fine-tooth comb strand by strand, staying as close to the root as possible. Do this for a couple of days. If you are not seeing anything coming off their head, you are probably safe. • Going forward, put tea-tree oil in shampoo and conditioner to prevent this. Or use hairspray, since lice hate hairspray, although boys hate hairspray even more. Take a peek at your daughter's hair, tell her everything is fine, JUST FINE, ask her to go sit naked on the porch (well, you'd like to), grab the car keys and dash to Whole Foods. Get a big jar of coconut oil because it's the best-smelling treatment. Pause at the cookie section, feel guilty for thinking about cookies at a time like this, then buy some good-looking chocolate ones anyway. On the drive home, flash back to when you had lice as a kid and your mom cut your hair so short that for months afterward, when you went into the ladies' room at restaurants or the library, people would stop you and say, "That's the ladies' room, son." Wonder how the trauma shaped you as a person. At home, get mildly perturbed when your daughter asks you to replace some batteries in her alarm clock, because doesn't she understand that you are at WAR? Have her stand in front of the bathroom mirror as you smooth globs of coconut oil into her hair. After several minutes, start to feel a little nauseous from the smell of coconut. Perhaps your Mounds bar addiction is cured, at last! Um, why are you still thinking about food at a time like this? Leave coconut oil in her hair for 20 minutes as you sit in another room to avoid the coconut smell. Itch your head some more. What did one lice say to the other? What is a louse's favorite drink? What are a louse's favorite boots? How many lice does it take to screw in a lightbulb? 100. One to screw in the lightbulb and 99 to make your mom go insane BECAUSE SHE DOESN'T HAVE ENOUGH TO DEAL WITH. OK, keep that last joke to yourself. Grab one of those little combs you swiped from the fancy gym (hoarding really does come in handy) and comb the coconut oil through. Make daughter shampoo twice as you peer into the bathroom mirror and wonder about the new wrinkles that have formed since the start of this saga. At bedtime: Share the chocolate cookies only if you'd like to. After she falls asleep, and you feel compelled to do something else, grab the kit of essential oils you once got as a gift but never used and see if there's tea tree oil (melaleuca). Tip-toe into her room and dab some onto her hair as she sleeps. You're the Lice Fairy! Go back and read more Facebook comments. Once again, you are posed with the quandry of whether or not to "like" bummer comments such as "Last year my friends' triplets got it!" and "Both of my girls and myself had them this summer, at separate times...five weeks worth of tears and treatments" because what if someone thinks you are LIKING the fact that they had to deal with lice? 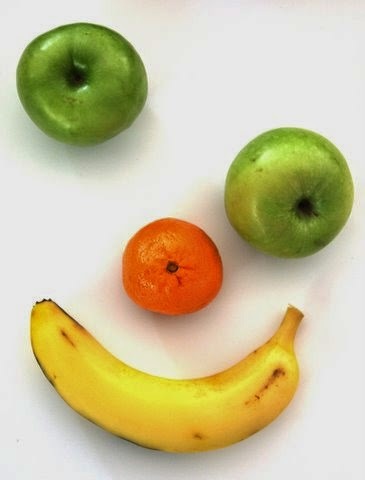 Get some good perspective: "I loved what my pediatrician said many years ago. 'If your child never gets head lice or pinworms you should be worried. When I asked why he replied, 'Because they wouldn't have any friends!" EWWWWWWW GROSS ICK BLECH pinworms. 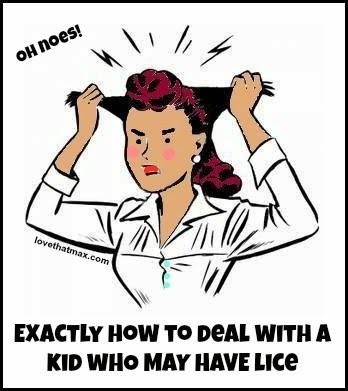 Worse than lice. Belatedly hear from an ex boss who's now at Consumer Reports. "Step one: Do not buy any of those shampoos and treatments," she tells me. The anti-lice article she worked on on has excellent advice, including how key combing is, though it does not recommending swiping the comb from a fancy gym. Fall asleep itching your head and batting your eyelashes to keep the lice out. Later in week: Finish up package of chocolate cookies and feel extremely relieved that child escaped lice. Because, you really didn't have time to deal. "I can't do this show until everybody stand up," Kanye West told his concert audience in Sydney on Friday night. "Unless you got a handicap pass and you get special parking and s**t."
This is not a guy known for his tact, but this weekend it was his ignorance that made headlines. 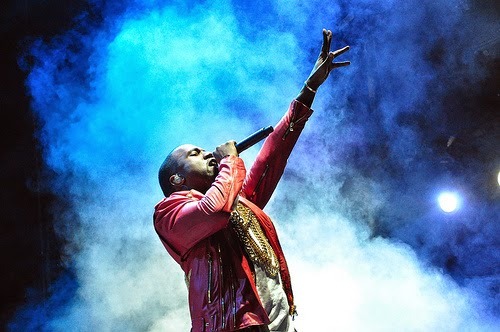 The concert was the last leg of Kanye's Yeezus tour. As you can see in the video, after most people stood Kanye noticed two people still seated and called them out, refusing to get on with the show until they got up. It's hard to see in the video but the Daily Mail Australia has a photo of a person waving a prosthetic leg as proof. "OK, you fine," said Kanye, like he was...Yeezus. After his bodyguard confirmed that another person in a wheelchair couldn't stand, Kanye went on to perform. Kanye had the same mandate at his recent Melbourne show, The Daily Mail reported, asking people to stand up "unless y'all sitting down because y'all handicapped." The guy who posted the clip on YouTube called it a "misunderstanding." One commenter thought the clip was "taken out of context." Another said it was an "honest mistake." Clearly, Kanye didn't realize that the people he'd spotted could not stand up. But his misunderstanding is beside the point. How crappy of Kanye to call out his fans with disability and to exclude them on the basis of their physical abilities, a dishonor they paid for. He didn't think it might be insulting to say what he did, twice? He didn't care? He couldn't think of a cooler way to engage an audience? There are plenty of ways to show the love at a concert, although I guess having people shout or wave their hands or, heck, just show up wasn't enough to appease his ego. It was also seriously crude of him to define disability as anyone who gets "special parking and s**t."
I have another definition of disability: being this closed-minded. Kanye got good press a few months ago when he gave a mic post-concert to a guy in a wheelchair who couldn't see the stage. But one gesture (and really, it would have been more decent of Kanye to move the guy to a better seat) means nothing once you understand that his mindset is all wrong. This is a man who once rapped, "They tryna put me on the school bus with the space for the wheelchair," as The Daily Beast notes. I haven't yet come across reactions from the people with disabilities who were at the concerts so who knows how much this did or didn't faze them, despite the disgust others have felt. Perhaps Kanye's publicist will encourage him to apologize (he's no stranger to apologies). At the very least, to look at ye olde bright side, this incident has gotten people talking and thinking about how people with disabilities deserve to be treated: like any other concert goers, like any other human beings. Welcome to the link-up, your post's home away from home. Settle in, put your feet up, make yourself comfortable. Like this: Love That Max: Max wants to be first and we let him. Is that so wrong? In the past few months, since Max has determined that he is going to be a fireman when he grows up, I have met dozens of firefighters. I didn't know any before, let alone gotten into discussion with the guys at our local firehouse (and there are only guys). Last weekend, the chief allowed Max to go upstairs to the staff's living quarters. Max plopped himself down at the gigantic dining table and we chatted with several of them. We talked about what they liked to cook. We talked about their kids. I learned that the station serves as backup for stations in several other local towns, and vice versa. It was sobering to find out that these men regularly risk their lives not just for people in our town but for those in others, too. I've been awed by how welcoming these firefighters are to Max every single time he shows up. 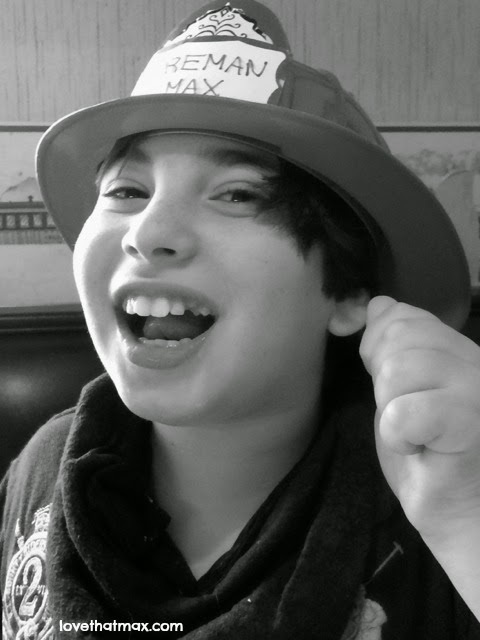 "Hi, Fireman Max!" they greet him. They show him the truck parts, opening compartments and explaining the equipment. They lift him up into the back seat of trucks. They turn on the truck lights and the siren and laugh heartily when Max does his imitation of one. They slide down the poles and put their jackets and helmets on him. They talk with him about the photos of fires lining the walls. They are the good people of this world. When we were on vacation in Atlantic Beach, North Carolina, in August, I saw a big chunk of metal resting in front of the firehouse we visited and I asked about it. It's a beam from one of the towers. 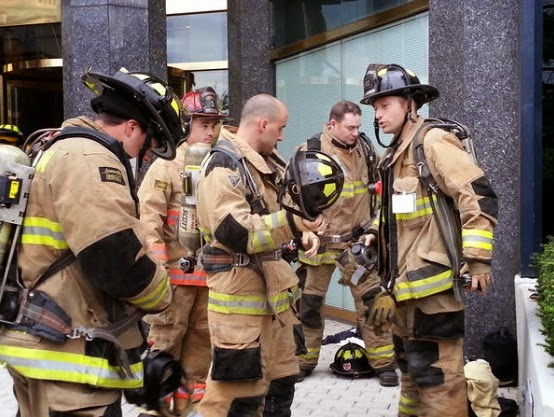 Firefighters at the station had served on 9/11. One of the men's fathers, a New York City firefighter, had died rescuing others from the Twin Towers. The men applied to get a beam, waited for two years, drove to New York to retrieve it, then set it up as a memorial monument. It's signed by two Queens, New York fire departments that worked with the Atlantic Beach crew during their time in New York. I'd never been that close to a piece of the towers and I walked around it, hesitant to touch it. It seemed holy. As Max plays out his firefighter fantasies, as the men we meet joke around with him, it's easy to forget that they do some of the most important and dangerous work there is. Few jobs are more selfless, as became tragically clear that September day thirteen years ago. Later today, the kids and I will bring cookies over to the fire station, as we've done before. But at 8:46 a.m., when the first plane hit, I'll be at local park joining in the mass moment of silence. I'll flash back to that morning, when I watched hell unfold on a TV screen in an office conference room. I will picture the young woman, Melissa Renee Vincent, whose friendly face I saw on "MISSING" flyers everywhere. I will think of the New York Bravest who we lost on 9/11 and the ones who perished of 9/11-related illnesses in the aftermath. And I will say a little prayer for their families, and the firefighters we have come to know. I will not forget those we lost. And I will never again take for granted the ones we have. Max wants to be first and we let him. Is that so wrong? In the last couple of months, Max has developed a new mission in life: He would like to go first. He wants to be the first one into the minivan when we go out. He wants to be the first one to walk in the door when we come home. He wants to be the first one to step into someone else's house when we visit. He wants to be the first one into the park, the playground, the mall, the museum, wherever. He does NOT want to be the first one to take his vitamins or to go to sleep at night, however. Go figure. Sometimes, as he dashes ahead of us somewhere, he'll announce "I win!" I'm loving this competitive side of him, which I've never seen before. I've been trying to find a new local sports activity or team where his gotta-be-first urges can be put to good physical use. But I've also been struggling with this. Sabrina, for one reason. Me to Sabrina: "Please let him go first" (while feeling guilty for asking, because she deserves to go first, too). She's usually good-natured about this, with the occasional eye roll. "Max is sooooo sensitive!" she likes to say, as a way of describing Max's requests and sensory issues. If she ever got really upset about this I'd put an end to it but she doesn't seem to mind or care. Nor do I let him do this around other kids. For our family, though, letting him lead the way seems like a small price to pay for keeping the peace, because he gets seriously upset if he does not go first. Still, Sabrina is only 9 years old and sometimes, she'll dash ahead of him anyway and Max will let out a roar. That's what happened at the diner the other day. When he started having a meltdown in the waiting area, with all of us hungry and tired, I declared "Do over!" and we trudged out again and down the ramp so Max could go up first. If our family was ever in a reality show, it would be the most boring reality show ever. 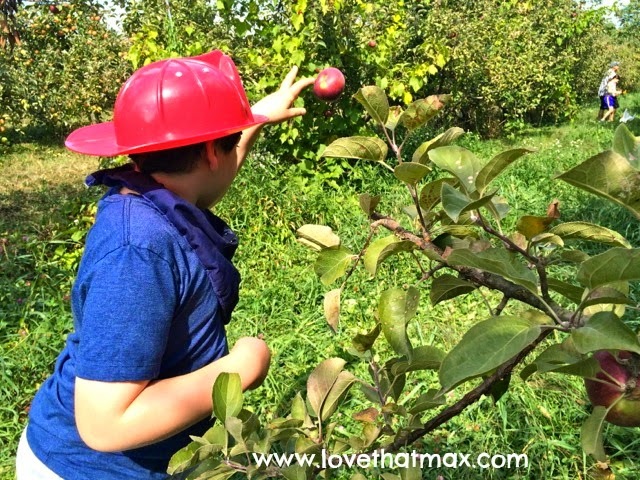 Something else I struggle with: What am I teaching Max by always letting him go first? As a child with special needs, he gets a whole lot of attention in our family. I do not want him growing up thinking the world revolves around him, and I usually do my best to not let him have his way. But then I think of how older children sometimes allow younger children, ones who are less adept than they are, to win races or games. This isn't that different. Max needs all the confidence he can get in this world. And if coming in fake first makes him feel good and victorious, well, there are far worse parenting decisions I could make. I don't have a wish list in my mind of Things I Hope Max Will Do. For one, thinking about them can be overwhelming (it would be a pretty long list) and for another, aching for him to achieve stuff does neither of us any good. As I've learned, Max will do things on his timeframe, and nobody else's. Or maybe he won't do them, and we'll deal as we always have. That's not to say that I don't get excited—seriously, seriously excited—when it seems like Max is figuring out a new skill. That happened over the weekend when we were at a restaurant and he started playing around with a straw. 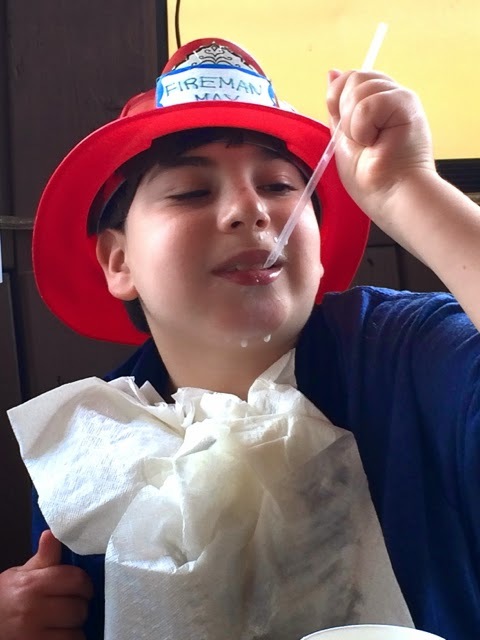 Sabrina started dropping water into her mouth from a straw, and Max wanted to do that with his Fireman Max milk (exactly how he ordered it from the waitress). I watched without saying a word, happy to see him pursing his lips around the straw and pulling off some admirable coordination of putting said straw in his mouth. When drinking from a straw will happen, who knows. If it will happen, who knows. I'm just psyched to see him try. Max seemed pleased with himself, too. Who knows, maybe one of these days he'll blow milk bubbles. Wheeeee! Yet another one of those achievements you'll never read about in any child development book. Once upon a time there was a boy named Fireman Max. 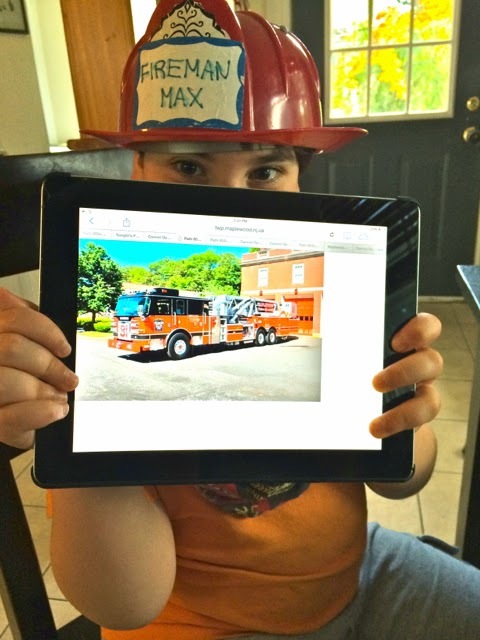 He would not respond to "Max," only "Fireman Max." He often liked to talk about his future life as a firefighter. One night, his mother wanted him to brush his teeth and even when she said "But firemen brush their teeth!" and fed him total lies such as "You can't be a firefighter if you don't have clean teeth!" he didn't care. So she hauled him into the bathroom and helped him brush his teeth. Moral of the story: You can lie to your kids but sometimes you have to use brute force. Once upon a time there was a boy named Fireman Max who liked to endlessly watch YouTube videos of fire trucks in action. One day he and his mom were driving in their minivan on the highway and Fireman Max was blasting a YouTube video of a fire engine. They were in traffic because there appeared to be an accident up ahead. Suddenly Fireman Max started saying "Fire truck! Fire truck!" His mom didn't pay much attention because Max often liked to say such things. But then, she looked in the rearview mirror and there was a fire truck right behind her trying to get by! And she hadn't realized there was an actual siren because the YouTube fire engine was blasting its siren! Moral of the story: Do not let your children develop an iPad addiction. Once upon a time, a boy named Fireman Max would screech in delight whenever he was traveling in his family's car and they passed a fire station. Usually, his parents were in too much of a rush to get wherever they were going to stop by, but once in awhile they would and Fireman Max would spend fifteen or twenty minutes exploring the new firehouse. When they left, he had a big smile on his face. Moral of the story: Take time to stop at firehouses. 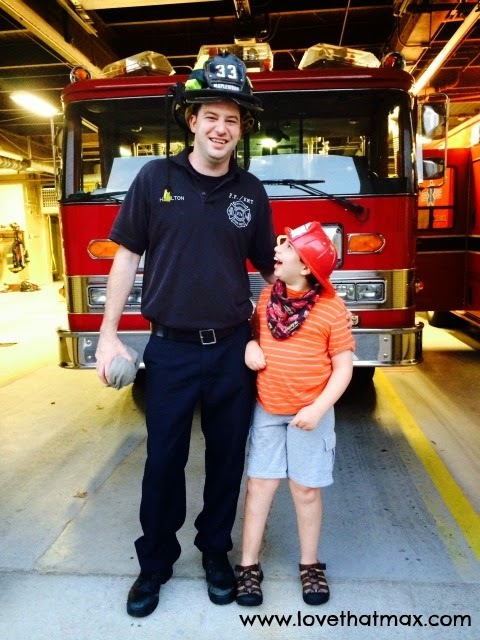 Once upon a time, a boy named Fireman Max arrived at the local fire station. He did not see his favorite ladder truck, Number 31, parked outside and he dissolved into tears, thinking it was gone. "Don't cry, sweetie!" said his mother. "We'll find it!" So then they walked into the fire station and were told the fire engine was out for the week for repair. Moral of the story: Don't cry over fire trucks in the shop. Once upon a time, a boy named Fireman Max was sitting upstairs in the local fire station, hanging out at the dining room table with five firefighters. They were talking about fires, mac 'n cheese and life in general. Fireman Max asked if they lived in the fire station and they said no, they had houses. Firefighter Max said he wanted to marry a firefighter when he grew up. "So you want to marry a lady firefighter?" one of them said. "No!" said Max, laying a hand on the fireman seated next to him and gazing at him adoringly. "Whatever makes you happy, Max!" his mom said. Awkward laughter ensued. Moral of the story: Avoid talk about politics, religion and marriage when visiting fire stations. 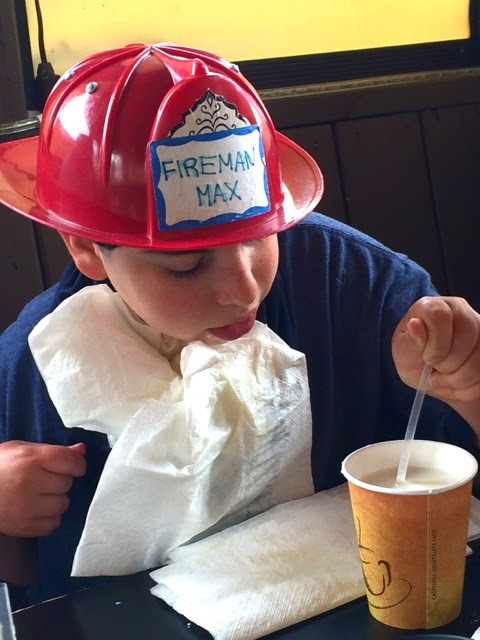 Once upon a time, a boy named Fireman Max decided he was going to have a firefighter themed birthday party. Even though it was months away he talked about it every 10 minutes, making sure that his family knew he needed to have firefighter cups, firefighter plates, a firefighter tablecloth and a fire truck pinata, plus a firefighter birthday cake complete with a photo of his favorite ladder truck. Moral of the story: Help. Me. 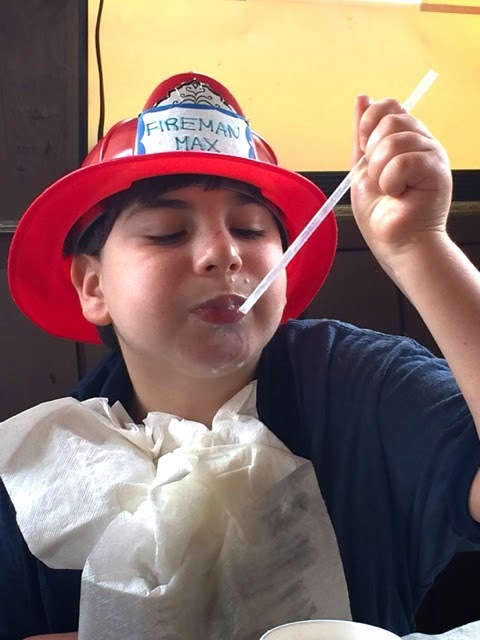 Once upon a time a boy named Fireman Max liked to beg his parents, every weekend, to take him once, twice, three times to the local fire station! His parents finally put their feet down and said just once a weekend. 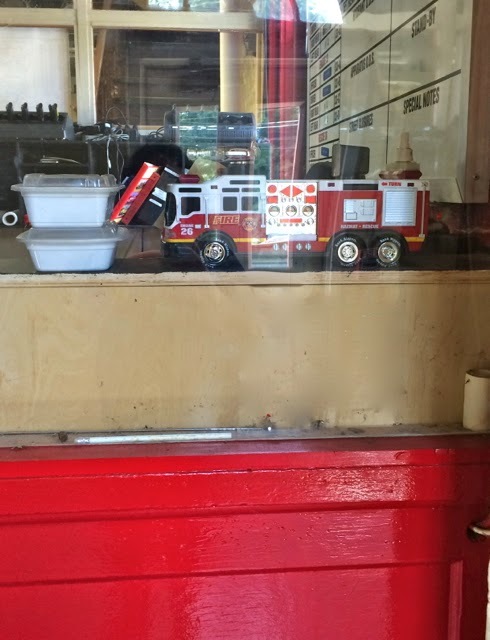 One day, Fireman Max brought his favorite toy fire truck to the fire station and then he left it there, in the radio control booth. This is because he realized that he would then have an excuse to regularly visit. The firefighters put a tag on it that read, "This truck belongs to little Max." Moral of the story: If you are really cute, you can get away with being conniving. Special Needs Blogger Weekend Link-up: Escape from back-to-school! Hope your back-to-school experience went well and if not so much, hope you had good wine. Meanwhile, here's some stuff to soothe your soul or at least distract you from the fact that you still need to buy eleventy billion school supplies. 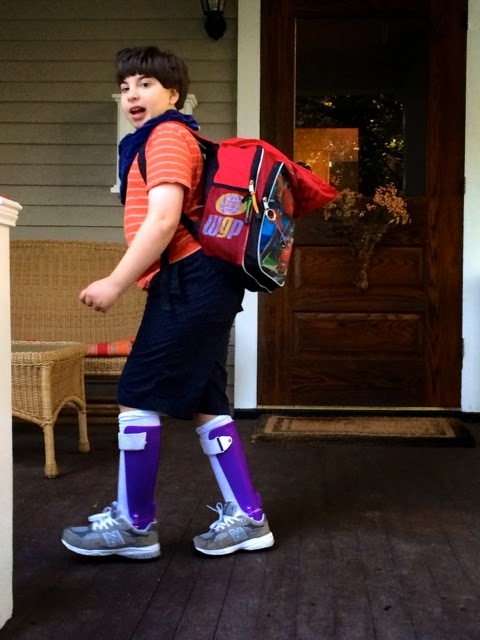 Like this: Love That Max: School bus service for kids with special needs. ACK! Motherhood's unofficial motto is "If it's not one thing, it's another." Special needs motherhood's unofficial motto is "If it's not one thing, it's a hundred others." It seems like I am always pushing for something, looking into something, figuring out something—or putting out a burning fire for something. This week's fire is brought to you by Max's bus company. In the scheme of things, as far as I can tell from what I've heard from other parents, they are a good company. But we've had several disconcerting incidents over the years, including one in which I found out Max wasn't being correctly strapped in by the aide and another in which Max's bus arrived 40 minutes late and we weren't notified because the driver didn't have our phone number. I've spoken with our district coordinator several times about the bus company, and had a long discussion with him back in March. 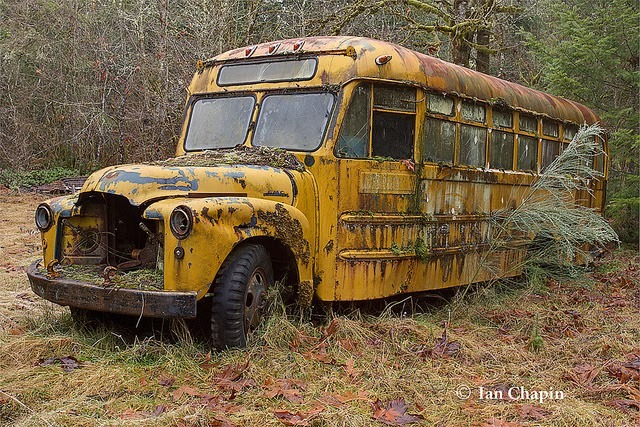 One thing I wanted to be sure of was that the company had a protocol for making sure all kids were off the bus, as there have been a number of news stories in recent years about kids accidentally left on the bus. (If you haven't yet checked with your bus service, do it.) I also told him that we never know which bus company and driver are picking Max up for the first day of school until, literally, the day before. Last year, the driver called us at 10:30 the night before school started to let us know she was coming. All together now: WTF!!! Cut to Tuesday night. 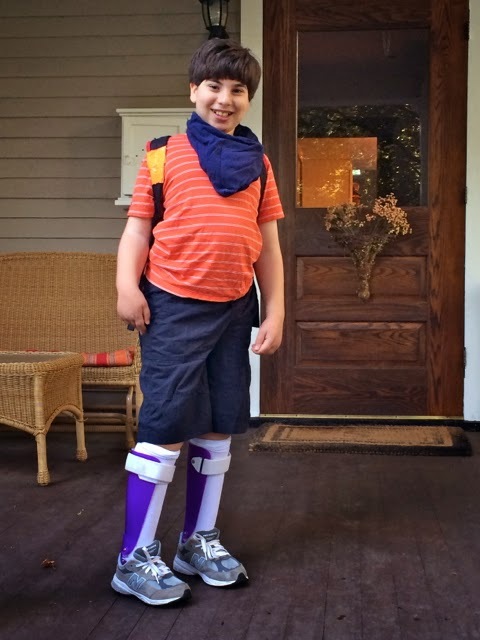 Max begins school on Thursday and, wait for it, no word from the company. I send a strongly (STRONGLY) worded letter to the district coordinator, saying I wanted him to call me with the information Wednesday morning, and give him my cell number as I'll be at work. To his credit, he calls first thing in the morning and says that the bus company told him Max's information "fell through a crack" and that they have told him they've called and given me the information. "Actually, nobody has called," I say. Then I again remind him how every year, we play the same game: Guess If Max's Bus Is Going To Show Up! And I say, strongly (STRONGLY) that he needs to address this last-minute issue with the bus company. He explains that they are often juggling kids who come in and out of the system, but I point out that it is not unreasonable to give a parent even just a couple days of advance notice. He tells me they will call. They do not, and I email him. Several more emails ensue. If the timing of the pickup has changed, I'm going to need to readjust our morning schedule. Finally, he tells me they have called my cell (nope) and he shares the information I need. Happily, the pick-up time is about the same. When I arrive home, I find out that the bus driver dialed the house at 11:00 a.m. It's as if the bus company has never done this before. End of rant. Back to life...and 99 other things. We had an unexpected treat on our vacation last week on North Carolina's Southern Outer Banks. Max's old music therapist, Joanne, emailed me after she saw a post I'd put up. She was only 45 minutes away, she wrote, and could she swing by? 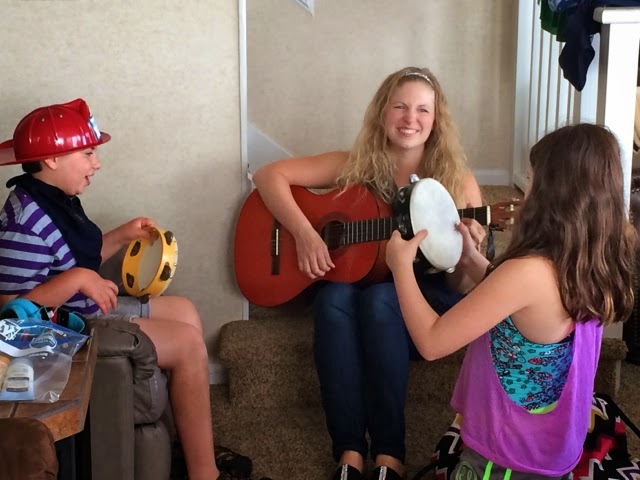 Joanne did music therapy with Max starting when he was four until she moved away last year and got married. When she walked in the door of our vacation rental, Max laughed and laughed, which is what he does when he's too gleeful to say anything. Sabrina gave her a big hug; she often sat in on their sessions. All of the therapists who have worked with Max have had a special relationship with him. But there are a few who've been with Max for years and years, ones who have seen Max mature and develop—and played an integral part in that. Joanne has gone through many Max phases, including his fascinations with purple, spaghetti, car washes and Cars 2, and come up with songs for all of them. She knows him. I was often at work when Joanne came by, but I sat in on many sessions with the Early Intervention physical and occupational therapists. I have a special place in my heart for them, and not just because of what they enabled Max to do or the tips they gave me to best help him. These therapists saw me at my worst, when I was despondent about what the future held for Max. As they worked and exercised his muscles, and I asked a million questions and expressed a billion fears, they provided therapy for me. They gave me hope, a scarce resource back then. Max has always been glad to see his therapists. He doesn't think of it as work, per se, both because it's been a natural part of his life since he was a month old and because I've always requested that therapists refer to what they do as play. 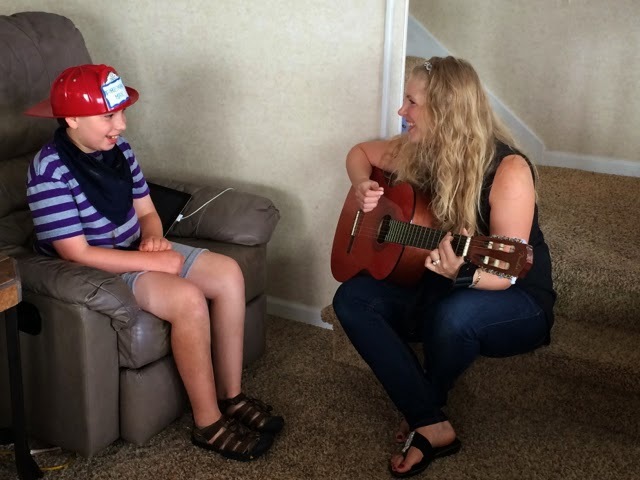 But therapy done with a guitar is going to automatically be more enjoyable, and so Max has always been particularly giddy for Joanne sessions. Before Joanne arrived, Max kept telling me he didn't want Sabrina to hang out with them. Here's the "Hello" song Joanne usually sings to start a session. She's trying to get Max to say hello to Sabrina—except he kept saying "Fireman Max." And cracking up, because he knew it wasn't fair to hog Joanne. We were all laughing, including Sabrina. But right after the "Hello" song, Sabrina jumped in, and then the three of them jammed for an hour and made videos. The wonderful Joanne works in the Jacksonville, NC, area; here's her Facebook page and musicandyoga@yahoo.com is her email. Tomorrow, my kids return to school. But they had quite the education last week—not to mention the time of their lives—when we traveled to The Crystal Coast, North Carolina’s Southern Outer Banks. I think the learning they glean through visiting new places is every bit as important as the kind they get in school. The trip was also a spectacular back-to-nature experience for us all. We rented an oceanfront house from Emerald Island Realty. The isle is named after the area’s lush greenery, a gorgeous complement to the scintillating blue of the ocean. Ocean Watch West is a nicely kept five-bedroom duplex, with a jacuzzi in the master bedroom that both kids took over and occasionally let us use. Max especially enjoyed sitting on the deck in a rocking chair and looking out at the water. The house is literally steps from the beach; we just cruised down a short wooden walkway and stairs and…sand! We didn’t even need sandals. Typically, there were barely any other people nearby on the beach, one reason the kids started referring to it as “our beach.” Crystal Coast’s beaches are spectacular, with sparkling, clear blue water and clean, fine sand. Every single photo I took looked like a picture postcard. The islands, 85 miles of coastline, are one of the only remaining natural barrier island systems in the world. The kids’ favorite activity: anything involving water and sand. Sabrina practiced gymnastics and tried to skimboard. Max conducted floating experiments with a boogie board. They dug endless sand castles, cruised at dawn and dusk for shells and jumped over and into countless waves. As hard as it was to tear ourselves away from the beach, there’s a whole lot to explore on the Crystal Coast. You can fish, go on dives (the Crystal Coast has more than 2000 sunken ships), canoeing, kayaking and sailing. Because Max is in the midst of a firefighter obsession we also dropped by some local fire stations, where he made some new friends. One day we headed to the North Carolina Aquarium at Pine Knoll Shores, a place filled with thousands of aquatic wonders including a rare white sea turtle named Nimbus, river otters, seahorses (my fave), moon jellies (Sabrina’s fave), assorted snakes (nobody’s fave) and a 306,000 gallon tank with sand tiger sharks and gigantic green moray eels. There’s a hands-on area for touching stingrays, horseshoe crabs and starfish, plus talks throughout the day by staffers. Visitors can gaze through a telescope on viewing platforms to check out egrets and herons on the marsh. A treat: the Dinosaur Adventure exhibit, open till November 1, with large-scale replications of 11 creatures (Max’s fave). He insisted on including them in family photos. Another activity that delighted both kids and adults: a double decker bus tour through charming Beaufort, North Carolina’s third oldest town (recently named America’s Coolest Small Town by Budget Travel). Originally a fishing village that dates back to the late 1600s, it’s filled with beautiful old buildings. I don’t think I’ve ever seen that many houses with historical plaques in one place, 150 of them restored to their original glory. We spotted a couple of wild ponies across the harbor on the reserve named after environmentalist Rachel Carson, and spent a couple of hours at the Beaufort North Carolina Maritime Museum. In 1718, Blackbeard’s flagship , the Queen Anne’s Revenge, ran aground in the local inlet. It lay buried until the shipwreck was discovered in 1996, and the museum holds its treasures and artifacts. We also learned about the fishing industry, various boats and the U.S. Life Saving Service (today’s Coast Guard), and gawked at a gigantic sperm whale skeleton hanging in the exhibit hall. The kids enjoyed the scavenger hunt, where they had to find various items around the museum. My kids haven’t yet started studying the Civil War in school, but they got an indoctrination at Fort Macon State Park, home to a Civil War fort. Built to defend the harbor against sea attacks, it was seized by Confederates in 1861, and stayed active through the Second World War. Visitors can fish, hike, swim on the shore and picnic. We wandered throughout the fort’s vaulted rooms, with replicas of a mess hall, a storage room and a keg powder room (the most important room in the fort; soldiers were not allowed to walk with shoes on, for fear of setting off a spark). There are also displays of soldiers’ quarters and life during the different eras in which the fort was occupied. We loved cruising the ramparts, which had glorious views of the Bogue Sound, Shackleford Banks and the ocean. Since there was only so much land-lubbering the kids could take, we hit Cape Lookout National Seashore one morning. We checked out the Discovery Room at Harkers Island Visitors Center, listening to the songs and calls of seashore birds and finding out how wildlife living on the barrier islands survive. Kids ages 5 to 13 can get info on Junior Ranger activities here, earning a badge by completing an activity booklet. Then we took the Island Express Ferry Service on a three mile ride to South Core Banks, home to a lighthouse. En route we passed Shackleford Banks and spotted several of 110 wild horses, the oldest documented horse population in America. Sabrina and I climbed the 207 steps to the top of the lighthouse, built in 1856, and celebrated our endurance with incredible views. We also hit the Keeper’s Quarters Museum, learning about the folks who watched over the lighthouse over the years. All that exploring and fresh sea air sure work up your appetite, an excellent excuse to dive into the area’s family-friendly eateries. Naturally, fresh seafood abounds. Over at Amos Mosquito’s Restaurant & Bar in Atlantic Beach, the eclectic menu was so tempting the kids didn’t even bother looking at the kiddie offerings. We shared scrumptious Fried Dill Pickles, Fried Green Tomatoes, Sesame Seared Tuna, a Grilled Steak Salad and a Mixed Seafood Grill with shrimp, scallops and soft shell crabs. Desserts were spectacular: Vanilla Creme Brulee, Chocolate Peanut Butter Ice Cream Pie and tableside S’mores (the appropriate dessert for a wannabe firefighter). I asked our server about the restaurant’s curious name. It comes from a childhood joke that owner Hallock Cooper Howard used to get wrong. It goes: Knock knock. Who’s there? Amos. Amos who? Now, the correct answer is “A mosquito” but Hallock always used to say “Amos Mosquito” and that’s the name her mom suggested for the restaurant. We continued our culinary adventures at Circa 81 in Morehead City, introducing the kids to the joys of tapas (small plates/appetizers), although the serving sizes were generous. We started with yummy She Crab Soup and Clam Chowder, plus addictive Loaded Potato Soup, along with Sesame Tuna Salad, Spinach Salad and the Ashe County Cheese Platter. Emboldened, the kids went on to try Sweet Potato Quesadilla, Savory Stuffed Brie, Medjool Dates (stuffed with almond, goat cheese and sunchoke and wrapped in bacon) and duck breast. Next time I try to get the kids to eat something new I’ve made, I’m going to serve it on tiny dishes and call it tapas. Too bad I won’t be able to recreate the Circa 81 desserts: Decadent key lime pie, chocolate chip cheesecake and chocolate creme brulée. The nice part about having a vacation house with a kitchen: You can totally ignore it and go out for lunch! The Village Market in Emerald Isle was a gourmet treat. The Chunky Chicken Salad sandwich (with red grapes, celery and pecans and lettuce on a croissant) was one super-tasty sandwich. Sabrina had an Asian Chicken Salad (grilled chicken, mandarin oranges, almonds, tomato and rice noodles on lettuce with sesame ginger dressing), breaking out from her usual chicken tenders. Dave loved the Greek Salad, with yellowfin tuna on top. And Max discovered he had a thing for Shrimp Corn Chowder. None of us had ever been to a food truck (a major trend) before the trip and The Dank Burrito Food Truck was a yummy, fun first. You find out where the truck is going to be by checking the Facebook page. It’s one super-cool ride; owner Clarke Merrell told us he painted it with a graphic designer. Max asked to sit in the driver’s seat, and pretended to drive the truck. Then he hovered by the ordering window, eagerly awaiting his side of guac. The mahi mahi burrito, carne asada burrito and jerk chicken burrito were fresh, super-tasty and generally outstanding. Best place to be on a hot afternoon, besides the beach: fro-yo at Twisted Spoon in Morehead City. Sometimes, frozen yogurts have a chemical aftertaste but the kind here was fresh and delicious. Kid fave: Cake Batter. Plus all of the toppings! Parent fave: a TV area where kids can hang out, so you can have a few minutes of peace to lick your spoons clean. No matter where we ventured, after we returned to the house we’d head out to the beach again, our home away from home. If it was dark, we’d sit on the deck and listen to the sound of the crashing waves. I can’t recall the last time the kids were that enchanted by something that didn’t involve a TV or iPad screen. It was yet another good lesson: Doing nothing but savoring the sea is entertainment enough.